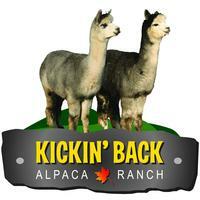 After months of delay our new herdsires are at Kickin' Back and ready to go to work! Guinivere's father was black AVA Guivir Zorro 089H & her grandfather on her mother's side was AVA Leanca Rico 287 a shining coal black male. Guinivere is a true black with bright, soft fleece, with pleasing crimp. Her conformation is solid. At the age of 8 she was still holding at 25 microns. 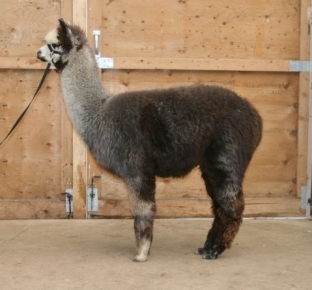 Guinivere was bred to RR Domino for her 2012 cria, a beautiful, healthy female, Gloxinia a true black with white markings on her face much like her mom. Georgian is a stunning tuxedo grey. 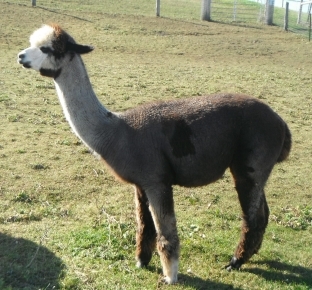 He has great conformation, good temperament and easy to handle. 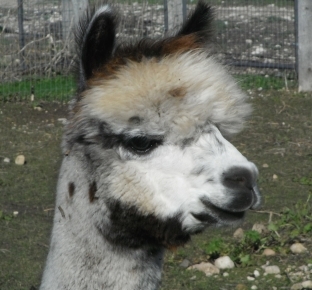 His fleece is excellent - a beautiful grey with lots of crimp and only 16.9 microns. 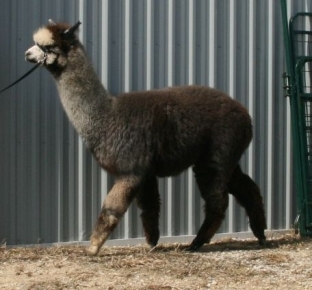 Georgian's first cria arrived - a true black male, Midnight Sun, dam is Minuet a fawn.